Tonight I was the victim of a crime, and I never saw it coming. Okay, neither of those statements is entirely true. 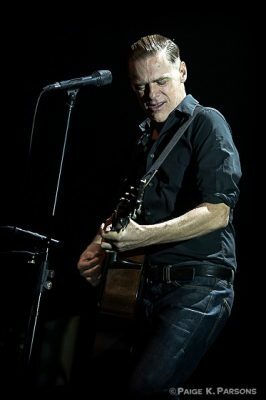 I did lose my socks tonight, but only because the iconic Bryan Adams rocked them right off. * And yes, I should have seen it coming, given that for as long as I can literally remember, I’ve been rocking out to this man’s music. 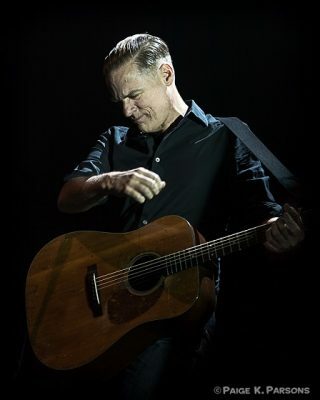 When I saw that he was coming to town (much earlier this evening at San Francisco’s Warfield Theatre, for those that missed it), I quickly made a note on my calendar. I knew this was one I wouldn’t want to skip, and I was excited for it. But it wasn’t until he began to play hit after hit that I started to realize just how talented this guy is. One thing, specifically, that I love about Adams’ tunes is that he can write a killer ballad/love song without it being syrupy sweet or cheesy. They’re romantic as hell, but they don’t make me want to vomit (or change the radio station). In my book, there isn’t much better than that. “Thank you!” During the next song, “This Time,” the house lights flashed every time the crowd sang a line in the song. “Hey, turn the lights on for a sec,” Adams requested. When the venue obliged, he quickly shook his finger and said, “turn it off.” Before he could offend anyone, he added, “you look hot!” Next was a song for another movie, written with a “really fantastic musician, Marvin Hamlisch,” followed by a list of other impressive names Adams has worked with in his decades-spanning career. He joked that the “first part of the show is like movie hour… without the movies,” and called the next song a “nice song about meeting someone” or conversation, finally suggesting he would “shut up and play it.” The song, “I Finally Found Someone” was one I’ve heard but never really listened to, and turned out to be one of the gorgeously romantic, non-cheesy ballads I mentioned at the beginning of this review. This man is a joy to watch. “Can’t Stop This Thing We Started” was next, during which Adams tried to get the (seemingly shy) crowd to help him sing. Several joined in clapping to create a beat, but few sang along. While Breit returned to the piano for the next song, Adams surveyed the crowd, asking if there were any “wild women here tonight?” He was looking for “one wild woman,” and when he spotted a certain blonde in the crowd, he asked her, “can you dance?” She came down from her seat to the front row, drink in hand, dancing all the way. Honestly, at first I thought she might make a fool of herself, but instead she turned out to steal the show. While Adams played “If Ya Wanna Be Bad, Ya Gotta Be Good,” our ‘wild woman’ earned every second of her spotlight. I don’t know how he knew to pick her, but she was the perfect choice: a great dancer with a good sense of humor and a little comedic timing. “Come down and get closer, come here!” Adams urged her. She took a drink from a girl in the front of the orchestra, continuing to dance. When the song closed, Adams and his blonde took turns blowing kisses to each other, until she held up her hand and pointed to her wedding ring. In response, he turned his backside to her and pointed to his bum. Then they shook hands, and Adams asked the crowd to give Jules her due, which they were happy to do. “I love this town,” he said softly, but just loudly enough to be heard. “I do?” While this prompted several boos around the venue, Adams took it in stride, singing several lines with a distinctly exaggerated country twang. During the next song, “Summer of ’69,” Adams clearly appreciated how much fun the dancing women in the front of the orchestra section were having. Meanwhile, my curiosity got the best of me and I did a quick Google search to satisfy it. My hunch was right, it turned out: though Adams has completely captured the spirit of the era in music (though I only know from history, having been born much later myself), I did the math. 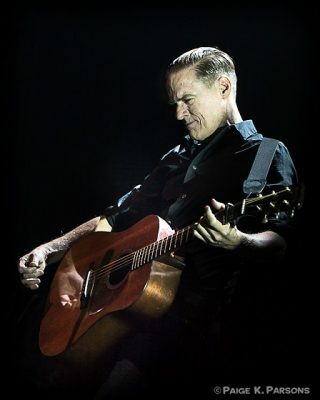 In the summer of ’69, Bryan Adams had only reached the ripe old age of nine. Still, this has no bearing on how enjoyable the song is and always will be, and he really rocked it out, especially given that this show was entirely acoustic. “Walk On By” was next, and then, “this is a pretty song. It could be my prettiest song.” Adams went on to explain that he’d written it at the age of 23, but that it was “one of those we held back for a bit before we released it.” He always liked it, but he “didn’t know if everyone else would like it too.” Though the song has now been successfully covered by multiple artists, he recalled the day someone asked him if he’d seen the version that had eighteen million hits on YouTube. “What’s YouTube? !” (He knows now; he has a YouTube channel. He just didn’t know at the time.) During the story, he forgot what exactly his point had been. “I was gonna say something… oh yeah. I can’t remember. I was gonna tell you a great story. I forget it. It doesn’t matter; it’s only the music that matters.” When “Heaven” began next, the crowd sang along from start to finish. When Breit came in on the piano, the audience cheered. This one featured a great little guitar breakdown, and I noticed that Adams seems to enjoy “faking out” the fans: he’ll sing the first part of a chorus’ final line and let the crowd finish it, and then he’ll sing the end of the line on his own with a huge smile, enjoying the interaction. After another round of bows and a quick “thank you very much,” Adams looked to Breit, who nodded. “Alright. I remembered what I was gonna tell ya: it’s kind of just a little more of an intro to what the show is about,” Adams explained. 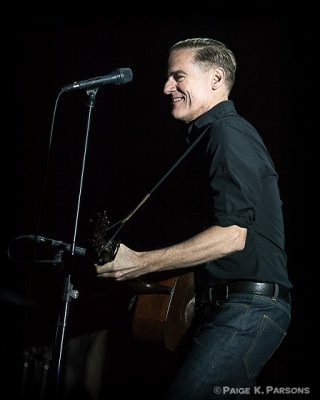 He went on to say that this type of show “breaks it down to the finest, most intimate version.” He suggested that some of the fans in attendance might be hearing some of his songs as though for the first time, “even if you already knew them,” which I’d already experienced personally earlier in the show. “This is how they’re created: this is what I do, this is my craft.” For that, the crowd cheered enthusiastically, and rightfully so. “Many of my songs are written for a band, but they start simple, just like this.” Next was a song he wrote with two of his favorite musicians: Sting and Rod Stewart. The song, “All for Love,” was the next to give me the chills when the audience sang the chorus with the singer. Though it was on the radio back in 1993, I remember the harmony between the three musicians so well, and it’s completely different to hear a crowd try to fill that sound, but it worked. It was excellent. This show put one of Adams’ songs in my all-time Hall of Fame playlist. “Let’s take a request,” Adams suggested to Breit. “18 Till I Die!” a woman named Denise requested from the front of the orchestra, and they quickly obliged. “Something like that,” Adams said when they’d finished, adding that there was a “set list in my mind. I’m getting there. I promise you, I’m gonna play that song. Hang on to your pants!” he teased. “What are we doing, Gary?” The next song, he said, was featured on his (live) Bare Bones record. He also noted that it was recorded in the past by “a guy from American Idol,” who “really pissed me off,” because of his beautiful version, which Adams called “great.” (The contestant he referred to was winner Taylor Hicks.) “I wanna do it because it’s called ‘Right Place,’ and I feel like I’m in the right place now.” After that came “The Only Thing That Looks Good on Me is You,” a quick “thank you, San Francisco!” and a bow (top hat and all) to a crowd on its feet. With that, Adams left the stage. “Thank you very, very much,” he said as the house lights came up again. He tossed out the rest of his guitar picks, threw out another thanks to his “wild woman Jules,” and thanked everyone once more for coming out. As he accepted a bouquet of roses from a woman in the crowd, he donned his top hat once more and left a room full of cheering people, thrilled by his performance. *Okay, I admit it: I came home with socks and shoes both still on my person. No socks were actually harmed in the making of this review! Still, damn. What an absolutely amazing show! I don’t know why I sound so surprised; I’m definitely not. 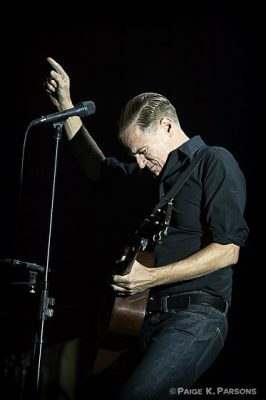 I don’t know anyone who wouldn’t have enjoyed this man’s performance, as most everyone agrees he’s a fantastic musician. Furthermore, it’s almost always fun to see an artist like this in a small and/or acoustic setting, but I had no idea how awesome his voice would sound live, or how charming he would be in person. Someone said “see you next time!” to him and he said, “I’d rather see you Thursday!” At first, I thought he was joking, but then remembered that he’s playing Santa Rosa in a few days. I’m tempted to get a ticket and go see it all over again. You definitely should. Trust me.